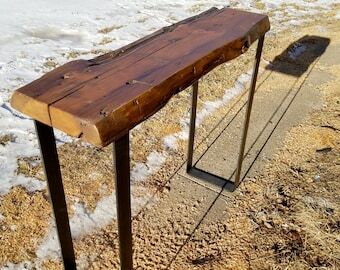 Reclaimed wood entryway table with industrial pipe legs. This unique piece sports an asymmetrical, shaggy edge and original square nails. We have smoothed and flattened the top surface so you can set glasses on it while retaining the textured surface. This piece is ready to ship and will elevate any entryway. 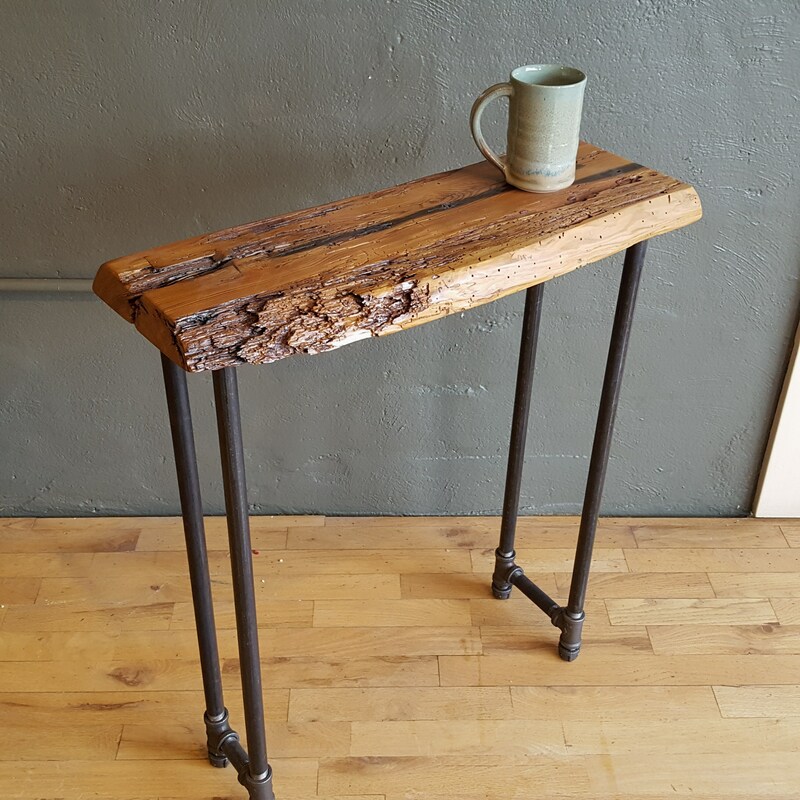 Created from authentic, hand-hewn, salvaged wood from log cabins and barns in the upper Midwest. We use a low VOC, non toxic finish that binds the rough wood fibers. Like all reclaimed, upcycled, repurposed and recycled products there are flaws and nicks and knotholes. It's not Ikea. The legs will ship unattached. Quick assembly with a phillips screwdriver. Adjustments to accommodate uneven floors can be made by you with the adjustable bottom caps with a wrench or pliers. Absolutely gorgeous! An incredible addition to my living room. Chris & staff were very patient with me -- I asked a ton of questions before making a custom order -- and were always available to help me figure out every aspect of my order so that it would be perfect to my liking. Even helped me figure out what kind/height of bar stools to get to match. My shipping address was entered incorrectly and FedEx had picked up the order--Chris drove around his neighborhood and intercepted the package--brought it back to his shop and changed the address to the correct one. Who does that? People who care do that!